TANTALUM is probably not one of the elements on the Periodic Table that youll remember from school chemistry. Dull grey and chemically inert, its principal use is for making electronic components, specifically tantalum capacitors which are capable of achieving high capacitance in a very small volume. Therefore tantalum, despite its scarcity, is in demand for use in mobile phones, PDAs and laptop computers. Tragically, the value of coltan is linked to the current round of bloody wars in the eastern provinces of the Democratic Republic of Congo. The columbite-tantalite ore from which both tantalum and niobium are extracted, colloquially known as coltan, is found in relatively easy-to-work surface deposits in the provinces of South Kivu (at Mwenga, Kamituga, Shabunda, Kalehe and Kabare) and North Kivu (at Masisi, Walikale and Lubera). There it is mined by artisanal methods, by forced and extorted labour under the control of the various militias who are terrorizing the area, and exported to the world market to fund their acquisition of weapons. Coltan is not the only one of Congos rich resources that are being pillaged in this way. An estimated US $70m worth of cassiterite (tin ore) is also reaching the world market from war-torn Kivu. Indeed, from late 2002 the price of coltan took a tumble after the US Defense Logistics Agency unloaded its tantalum stockpile onto the open market, but the price of tin went up after Japan and Europe enacted safety legislation to have lead-based solder replaced with tin solder for electronics fabrication. In this mornings (11 Nov) edition of Business Daily on the BBC World Service radio, the focus was on cassiterite. Global Witness, through its researcher Carina Tertsakian, has been keeping an eye on the exploitation of Congos resources for several years. In February 2007, Global Witness called on the UK Government to call to account a Wembley-based business, Afrimex, run by Ketan Kotecha, who has been buying coltan and cassiterite in the region of Goma since 1996, to the profit of the Goma faction of the RCD, the Rally for Congolese Democracy. The cassiterite is taken out through Uganda and Rwanda, and so to the Indian Ocean coast, from which it is transported to smelters in India and China, Thailand and Malaysia. 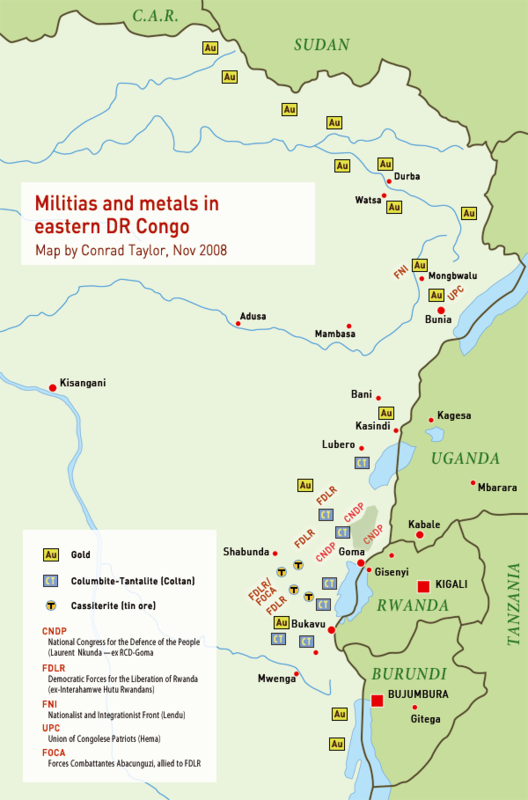 There is also reportedly a cassiterite and tantalum smelting plant in the Rwandan town of Gisenji, just across the border from Goma, operated by a South African firm (MPA) whose founders have links to the Rwandan Patriotic Front party (see 2007 article by David Barouski). Congo has many other minerals such as uranium, cobalt, diamonds and gold. The rival militias of the FNI and the UPC in the Ituri region across the border from Uganda are involved in organising the artisanal mining and smuggling of gold, and there have been documented dealings between the FNI and the multinational company AngloGold Ashanti around the operation of a mine at Mongbwalu. THE MURDEROUS FACTIONALISM of eastern Congo, and the motivations of Congos neighbours in meddling in her misery, are difficult to understand: these are convoluted ethnic tensions with their roots in the colonial past, combined with opportunistic looting. Let me attempt an explanation, as I understand it. The current fighting, in which the rebel general Laurent Nkunda is currently threatening to topple the Congolese government of Joseph Kabila, is just the latest round in a chain of Congo wars from 1996 that have cost the lives of millions. However, the roots of the Kivu and Ituri conflicts can be traced back even further, and over the border into Rwanda and Uganda. After the First World War, the Belgians who controlled the Congo also took over the territories of Rwanda and Burundi from Germany under a League of Nations mandate. The Belgian policy was to strengthen aristocratic Tutsi dominance over the Hutu, strengthening the ethnic distinction between them, just as they similarly promoted the ethnic Hema over the Lembu in the Ituri region of North Congo. In response to Tutsi dominance, the Hutu in Rwanda organised for their emancipation around Gregoire Kayibanda and his PARMEHUTU party. Fighting broke out in November 1959, in which thousands of Tutsis were killed and many more fled into southern Uganda and into the South Kivu province of the Congo, where they became known as the Bunyamalengi. The Ugandan governments of Idi Amin, and then Milton Obote, refused to allow the Tutsi refugee community to integrate in Ugandan society. However, when Yoweri Museveni launched his civil war against Obote from the south west of Uganda, the so-called war in the bush (198186), he recruited a large number of Tutsi refugees into his National Resistance Army. Thus when Museveni came to power, and the NRA was rebadged as the Uganda Peoples Defence Force (UPDF), it contained a large contingent of battle-trained Tutsi soldiers and officers, among them the current Rwanda president, Paul Kagame, who at that time was a head of military intelligence in Musevenis army. The native Ugandan officers may have resented the Rwandan Tutsi role in their army; in any case, the Tutsis aspirations lay elsewhere. They formed the Rwandan Patriotic Front in 1986, trained their army, and in 1990 launched an attack on Rwanda with Ugandan support. (Note: the French provided support for the Hutu régime during this fighting.) After 3 years of warfare, the Rwandan military dictatorship under the Hutu president Juvénal Habyarimana signed a cease-fire agreement with the RPF, the Arusha Accords, and the United Nations sent a security force, UNAMIR. What happened next is a matter of much conjecture. Did Habyarimana intend to abide by the Accords, which would have ceded much power to the Tutsis? In any case, six months later, his jet plane was shot down by missile fire as it approached Kigali airport, killing all aboard. Controversity is still rife as to whether the assassination was the work of the RPF, the Ugandans, or an extreme faction among the Hutu leadership seeking to wreck the Accords. Almost immediately, the Hutu-led army and the Interahamwe militia groups embarked on a well-organised campaign of genocide within Rwanda against the Tutsi and moderate Hutu: some 800,000 deaths in about one hundred days between April and July 1994. It is notable that the UN forces did not intervene to stop the massacre of Tutsis. The RPF responded with an attack which occupied the north, east and south of Rwanda by June, and by July they had reached Kigali. Now France obtained UN Security Council support for a 3000-man military intervention, Opération Turquoise, which set up a protection zone in the west of the country through which two million Hutus, including the military and the Interahamwe killers, fled into the Congo (then known as Zaïre), principally to North Kivu. Remnants of those Hutus who escaped to the Congo are now organised under the control of ex-army and ex-Interahamwe militia, as the Democratic Forces for the Liberation of Rwanda or FDLR. Thus Rwanda, Uganda and Congo had fallen into a pattern of cross-border strife. From 1994 to 1996, Paul Kagames new Tutsi-dominated Rwanda government took vengeance against the Hutus in Rwanda: for example, refugee camps were shelled with heavy artillery. In 1996, Kagames RPF forces invaded Zaïre, in part to seek out and destroy the Hutu forces there, but also to join an alliance with the Congolese rebel leader Laurent Kabila. Yoweri Museveni also threw the Ugandan UPDF forces into the civil war (the First Congo War) on the side of Kabila and Kagame. The Rwandan army, the RPF, also armed and organised their Tutsi brothers who had been resident in Kivu since the sixties: the Banyamulenge. Acting together as the Alliance of Democratic Forces for the Liberation of Congo-Zaïre (ADFL), these forces first destroyed a series of Hutu refugee camps, then turned towards the capital, Kinshasa. Lacking popular support, the old and corrupt régime of Mobutu Sese Seko collapsed  and on 17 May 1997, Kabila declared himself president of the Democratic Republic of Congo. THE SECOND CONGO WAR broke out in August 1998. In the following five years, eight African nations and 25 or so armed groups would engage in a bloody struggle that claimed 5.4 million lives  mostly to disease and starvation. The conflict was triggered when Kabila, seeking to be rid of his erstwhile allies, ordered all Rwandan and Ugandan forces out of the country. The Tutsi Banyamulenge in the town of Goma, feeling threatened, revolted; Rwanda responded with immediate military assistance, and a well-armed Tutsi rebel group was set up: the Rally for Congolese Democracy (RCD). Rwandan and Burundian forces entered the war, as did the Ugandan UPDF. Within a couple of weeks, these anti-Kabila forces had control of the diamond centre of Kisangani and the Inga hydropower station, and Kabilas régime seemed doomed. But Kabila was rescued because Namibia, Zimbabwe and Angola entered the war on the governments side. (Both Zimbabwes Robert Mugabe and to a lesser extent Namibias San Njoma had significant mineral exploitation ventures in Congo.) Chad, Libya and Sudan also joined in on Kabilas side, and financial support was forthcoming from US, Canadian, Australian and Japanese mining and diamond companies in exchange for concessions. Thus the Ugandan and Rwandan forces were held off. One of the consequences for Kivu was that Joseph Kabila, who succeeded his assassinated father as DR Congo President, encouraged the unification of the ex-Interahamwe and other Hutu movements into the Democratic Forces for the Liberation of Rwanda, and set them to attack the RCD and the Rwandan Army (RPA)  a dangerous game. The FDLR continued its war against Rwanda and the Tutsis of the RCD after the ceasefire, and has done so up to the present day; though its strength is much reduced, this provides the pretext for Laurent Nkundas refusal to stand down  he claims to be protecting Kivus Tutsis  and for Rwandas intransigence too. There are many people who wish that the perpetrators of Rwandas 1994 genocide could simply be magicked away somewhere. In 2005, Human Rights Watch published a report entitled The Curse of Gold. It documents how the Ugandan Peoples Defence Force, having taken over the north of the Congo in 1998, immediately took direct control of gold-rich areas in Haut Uélé and coerced local people into mining gold (estimate: one ton, at $9 million) for their benefit. Ugandan Lt. Okumu initiated artisanal mining in the Durba and Gorumbwa mines, but accelerated it dangerously with explosives, resulting in the deaths of a hundred miners when the Gorumbwa mine collapsed. The Ugandans were not alone in taking what they could from Congolese territory they occupied. In April 2001 a UN panel of experts investigated the illegal exploitation of diamonds, cobalt, coltan, gold and other resources by Rwandan, Ugandan and Zimbabwean forces and recommended that the Security Council impose sanctions. Their final report (Final report of the Panel of Experts on the Illegal Exploitation of Natural Resources and Other Forms of Wealth of the Democratic Republic of the Congo) contains many detailed allegations. Although the Rwandan and Ugandan armed forces withdrew from Congolese territory in 2002, they left behind their proxies. As a result of this, but also because of other disagreements and clashes, including open conflict that broke out in 2002 between Uganda and Rwanda, the situation became much more complicated. In Ituri, Uganda backed an ethnic Lemba force, the Nationalist and Integrationist Front (FNI), which waged war with a Rwanda-backed ethnic Hema force, the Union of Congolese Patriots (UPC). In 20023, they were openly at war for control of the Mongbwalu goldfields. The UPC were assisted with air-drops of weapons from Rwanda; in 2003, some FNI attacks were directly assisted by Ugandan troops. In Kivu, the RCD had split into a Kisangani-based faction (RCD-K, later RCD-ML) backed by Uganda, and a Goma-based faction backed by Rwanda (RCD-Goma). The latter appears to have control of part of the coltan and cassiterite production. Though much of the RCD-Goma faction joined the newly integrated national army in 2003, Laurent Nkunda pulled his followers out and moved to the forests of North Kivu, forming the CNDP, which is now at war with the DRC and United Nations troops. As already noted, the extremist Hutu forces of the FDLR are also still in play. For a while they were aligned to the DRC forces, but now act independently. They appear to control the bulk of the cassiterite mining around Walikale and Bisie in North Kivu. All these militia armies maintain their power and re-stock their arsenals by exploiting the population and the environment. In the context of Congos mineral wealth, one of their best means is by organising forced artisanal mining, or controlling and exploiting it, usually through an informal tax. However, this makes economic sense only because the people who organise the trade locally have links to and protection from powerful people in Rwandas and Uganda military and political élites  people who are in a position to provide the means to transport and trade the ores out to the world market. However, there is another tier of responsibility: the unscrupulous dealers, and the multinational companies who are prepared to buy gold and diamonds, casseritite and coltan without asking too many questions. And what responsibility are we then to ascribe, say, to the mobile phone manufacturers whose handsets may be built using blood tantalum? Coltan prices on the world market have ratcheted up and down over time. One oft-quoted suggestion is that Sonys desperation to acquire enough tantalum capacitors for the Sony Playstation 2 launch in 2000, and a spike in demand for mobile phones and DVD players, drove the price of coltan from $49 to $275 a pound in 2000. Professor Rev. Ferdinand Muhigirwa SJ of CEPAS, the Centre of Studies for Social Acstion in Kinshasa, cites prices per kilo of coltan as $400 in 1999, $320 in 2005. Thus high prices were the norm when Rwandan forces and their proxies were extracting coltan from the Congo. But now? Muhigirwa quotes a mere $32 per kilo of coltan for 2008. However, he believes that artisanal production in Congo will be continued as a matter of survival. How to liberate African publishing? What if Out of Office gained some intelligence?